Click on the appropriate link to contact us through one of our forms. After you submit your form, we encourage you to continue and remember you can always pick up the phone. Click on the link to the form you need to download. After the link opens as a PDF file, save it to your computer, fill in the information, and fax it to us at 856-327-9975. Check out the following sites for more information. Improve Your Profits is a business tool for specialty coffee retailers and gourmet food store owners. It provides helpful tips and proven sales ideas / methods derived from years of experience in the business of selling and roasting gourmet coffee beans. 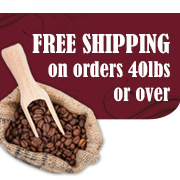 Looking to buy coffee in 1 lb. bags? There is a 2 lb. minimum for this site and not all KMO coffees are available.